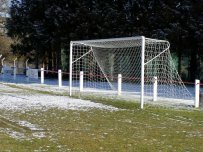 Presteigne Reserves’ scheduled home tie in the Pip Samuel (Electrical) Mid Wales League (South) Cup on Saturday, 2 February has been postponed. The Reserves were due to host Hay St Mary’s Reserves at Llanandras Park but the pitch was deemed unplayable after an inspection late on Friday afternoon. To be fair, the surface took a fair bit of hammer during last weekend’s home match and, given the weather of the past week, the grounds staff haven’t had the easiest of times in trying to work on it. If you factor in the freezing temperatures of the past few days – well, you don’t need to be a genius to work out it was always looking unlikely. But there is better news over the first team’s fixture at Aberystwyth University in the MMP with Norman Lloyd League, second division. As far as we are aware, that corner of Ceredigion has missed the worst of the icy blast and all the signs are that game should go ahead as planned.